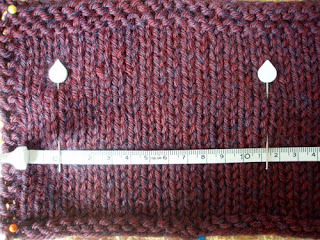 I don't know about you, but I find counting the stitches while holding a ruler against a gauge swatch all rather difficult and annoying... like I needed a disincentive! Secondly, wash and block it (ditto!). It doesn't take long! Honest! Thirdly, read your pattern for how many stitches you're aiming for in the gauge swatch (eg 22 stitches : 4" or 18 stitches : 10cm, or whatever). Fifthly (pretty sure that isn't a word), get out your ruler, and measure the distance between the two marker pins. Sixthly (now that's a bugger to say), you can see very easily now if you're on gauge! If the number of stitches you're aiming for (say 22 in 10 cm) measures up as less than 10 cm, then you need to use slightly bigger needles (you've got too many stitches in the 10 cm / 4"). If the 22 stitches measure up as more than 10 cm, your gauge is too loose, and you need to use slightly smaller needles (you've got too few stitches in the 10 cm/ 4"). While it mightn't come across well in words, I do find it easier to 'read' my gauge using this method (ie knowing the number of stitches, and seeing what it measures, rather than knowing the measure, and counting the stitches). I hope you find it helpful too. Our model today was Bendigo Rustic 12ply, wearing Red Tweed. Styling by Jejune. Pins by Haberdashery Heaven. Towel by Ye Olde Linen Cupboarde. 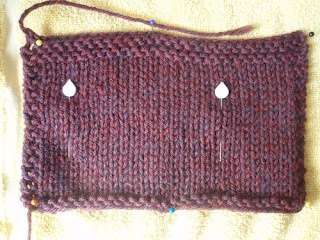 I've only just started swatching for projects where gauge is important (very naughty, I know), and I find stitch counting a pain too. I'm just about to swatch for a new project, and I think I might give your technique a burl. Thanks for the tip! oooh, good idea - i always go cross-eyed trying to figure out the half stitches to fit them into the right measure! I didn't know that was a wrong way!!! I always have to use a larger needle and I hate that so I make with the maths so I can use a smaller needle!!! I love Ye Olde Linen Cupboarde!!!! It's completely delightful the way you combineinventive practicality with charming whimsey. Wonderful post! Well, that's all a great idea. I wish I actually swatched and washed. 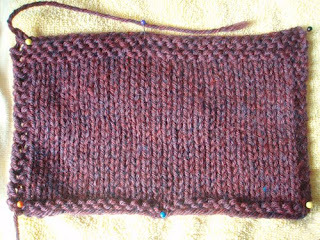 I usually knit a square and then unravel it after checking. SO, can I send my sample yarn to you to do it the right way? You're so right about how painful it is to count with a ruler, even with the nice Knitpicks one I've got that has a magnified clear strip on it, it's still awkward. I like this method better. Thanks! informative, and entertaining! you make me want to swatch. well, for a minute you did. i love the colours in the red tweed, will look lovely on you. D'ya mean I hafta wash the bloody swatch as well?? No wonder I never swatch. Anyway, (seventhly), swatches lie! At least they always do for me. Hahaha! That's where I get my towels, too.... Love your tutorial. I am, as we speak, unravelling not just one, but TWO sweaters because I DID NOT DO A GAUGE SWATCH CORRECTLY. I will try your technique next time.